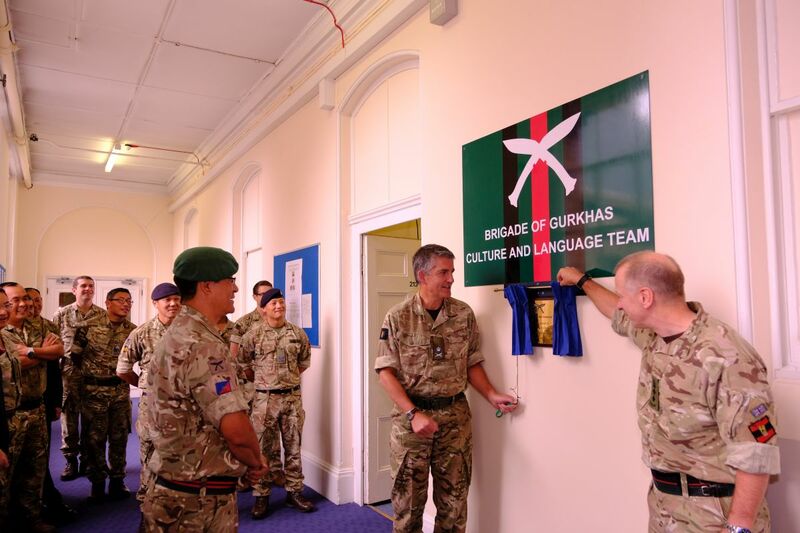 The Deputy Chief of the General Staff and Colonel Commandant Brigade of Gurkhas, Lieutenant General N A W Pope CBE officially opened the offices of the Brigade Culture and Language Team (BCLT) at the Headquarters Brigade of Gurkhas( HQBG) on 11th September 2018. A short but poignant ceremony was held in HQBG to mark the special occasion attended by all HQBG staff. 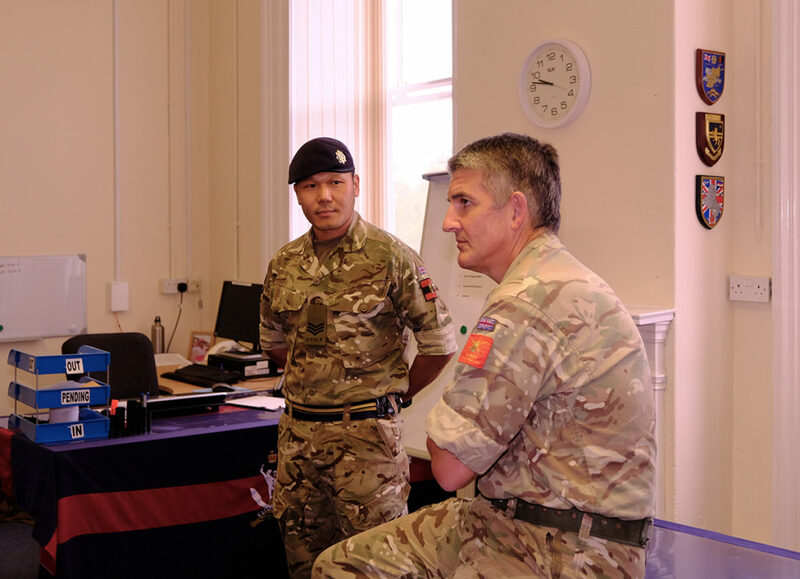 Colonel Brigade of Gurkhas and Officer Commanding BCLT, Major Bijayant Sherchan MBE welcomed the General and took the opportunity to brief him. He took a keen interest on the role and future activities of the team. BCLT was formally established as a part of HQBG on 1st Aug 18, following the restructuring of the Learning Development Wing at Catterick. The BCLT has a long and illustrious history which date back to 1947 when the Brigade of Gurkhas moved to the Far East from India. From its humble origins as the Gurkha School of Education (GSE) in Johore, Malaysia it has evolved into a modern Nepali language centre in the heart of England. Nepali language assessments are run in accordance with the materials developed by the Institute of Linguists Educational Trust (IoLET) and controlled and moderated by Defence Requirements Authority for Culture and Language (DRACL) who is the Training Requirements Authority for Culture and Language in the MOD. The BCLT has a remit to deliver both core and outreach programmes to British officers, soldiers, dependants and MOD civilians within the Gurkha footprint. Through it, the BCLT is committed to the upkeep of a central aspect of the Brigade’s culture and tradition and thereby, uphold the Gurkha Kaida. The BCLT is responsible for the delivery of the following packages:  Survival Nepali Culture and Language Course. A ten-week long residential course delivered in British Gurkhas Pokhara, Nepal. Basic Nepali Culture and Language Course. A three-week long course delivered in HQBG. It is tailored for personnel attached to BG units to provide a basic understanding of Nepali language, culture, and tradition.  Introductory Nepali Culture and Language Course. A short course delivered to British staff and dependents serving in BG units. Bespoke Courses and Outreach Programmes. Outside delivery of main courses, the BCLT has the capacity to deliver specific and tailored distributed outreach programmes to educate British personnel within or outside the Gurkha footprint in the fundamentals of Nepali language and culture.